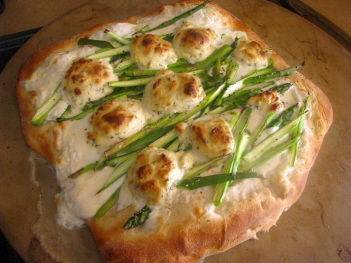 Try this delicious asparagus pizza recipe. This is a great vegetable pizza recipe. This homemade pizza recipe is perfect for entertaining. I realize that the sound of healthy pizza recipes with asparagus might be a little odd to some, but you will be amazed at this recipe. Even if you aren't a big asparagus fan, this recipe might make you reconsider your feelings towards this healthy vegetable. I found the original recipe for this on tastykitchen.com and had to make it for myself. This is a veggie pizza recipe, but you could easily add some grilled chicken to make it extra hearty. Cut it into squares and serve it as an elegant appetizer at a cocktail or dinner party. 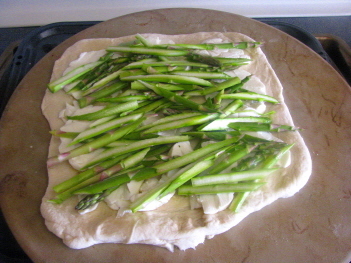 This asparagus pizza is very easy to make. You can make it in about 30 minutes total if you use a pre-made crust such as Pillsbury's pizza dough or a Boboli pizza crust. I think this pizza is best on a thinner, crispy crust. I made it on the Pillsbury crust and could've rolled it out a little thinner, but it was still delicious. 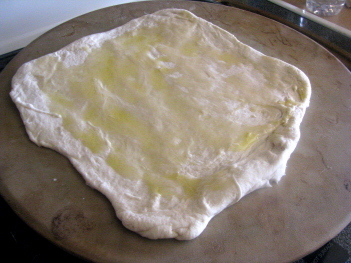 Place dough on a cookie sheet or pizza baking stone. Drizzle a thin layer of Extra Virgin Olive Oil over dough. Next, take a vegetable peeler and shave your asparagus into thin strips. I personally didn't have a good peeler so I used a sharp knife to cut the asparagus into thin strips. 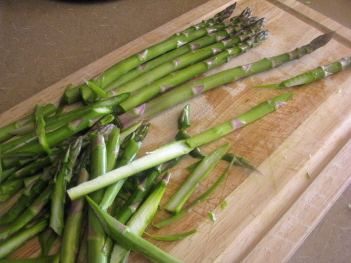 I used about 1/2 my asparagus bunch - but use a little more than you think you need because it does cook down. 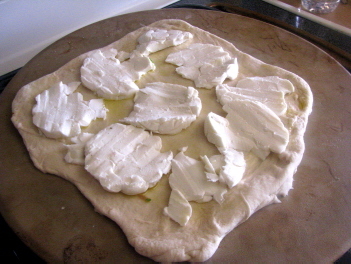 Slice the the Mozzarella cheese into thin slices and place on dough over olive oil. Sprinkle the asparagus strips on the cheese. 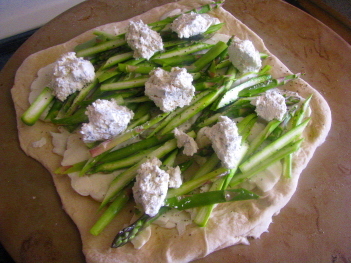 Take the Boursin cheese (I used Alouette cheese) and dot a few spoonfuls onto of the asparagus. Bake pizza for about 12-15 minutes or until the crust becomes a nice golden color. I did that because it was prettier!). I cut it into squares and took it a happy hour and everyone gobbled it up.